The Brother DCP-585CW is a wireless and also a wired all-in-one device known for performing essential tasks like printing, copying and scanning capably. The printer performs reliably especially when paired with components like Brother DCP 585CW ink cartridges. Its ability to perform reliably under different circumstances is reflected in the fact that it has built-in wireless (802.11b/g) and wired (Ethernet) interfaces, which empowers it to print and scan documents through uninterrupted access to digital camera media cards as well as USB flash memory. The scanning function of this printer is remarkable as it features flatbed copying and scanning which help it to scan not just different types of books but even objects smoothly. Besides, you can also cut costs big time by installing compatible Brother DCP 585CW ink cartridges in this printer that measures 390 x 375 x 180 (W x D x H) and weighs 7.1 kg. Other salient features of the Brother DCP-585CW printer include its widescreen 3.3” colour LCD display which gives an enlarged view of text and help menus for better viewing and convenient editing of images before printing. The printer can hold up to 100 sheets of paper, comes with a photo bypass tray with a capacity of about 20-sheets of glossy 4" x 6" paper and facilitates direct printing from a PictBridge-enabled camera. You can also avail of fast colour printing, courtesy its print speeds of up to 33ppm for black and 27ppm for colour. The Brother DCP-585CW printer also scans directly to email, media cards, OCR and other alternatives and uses various formats including JPEG, PDF and TIFF. Opt for very suitable and dependable components for the Brother DCP-585CW printer such as Brother DCP 585CW ink cartridges to obtain optimal results and experience. The Brother DCP-585CW printer is suitable for printing text documents and images at home and office. It is exceptionally good at some functions such as scanning though there’s some scope for improvement in other tasks. How to clean the print head for better print quality? Step 2: Select Cleaning option and press OK. Step 3. Select Black, Colour or All option and press OK. The machine cleans the print head. When cleaning is finished, the machine will go back to the standby mode automatically. Note: If you clean the print head at least five times and the print has not improved, try installing a new Brother DCP 585CW Ink Cartridges. How to check the print quality of Brother DCP 585CW printer for better print experience? Step 1: Press Ink Management. Step 2: Select Test Print and press OK. Step 3: Select Print Quality and press OK. Step 4: Press Colour Start.The printer begins printing the Print Quality Check Sheet. Step 5: Press Yes to start cleaning the print head. Step 6: After cleaning is finished, press Colour Start. The printer starts printing the Print Quality Check Sheet again. If the print quality is not improved yet, replace the old ink cartridge with the new Brother DCP 585CW Ink Cartridges, check the print quality. Q. I need good cartridges for my Brother DCP 585CW printer for full colour printing job. A colleague has recommended Brother DCP 585CW ink cartridges but I’d like to know if these are among the best cartridges that are compatible with my printer. Please advise. A. Yes, Brother DCP 585CW ink cartridges are known to be very good for colour printing jobs and rank among the best cartridges that go with your printer. They will surely meet your professional needs adequately. Q. I ordered an extra set of Brother DCP 585CW ink cartridges two weeks ago but don’t need them now. I have decided to return the unopened ink cartridges so can you please tell me the procedure for returns? A. Please give us a call on 048 30833221 or send an email on info@printerinkcartridges.ie . Keep your invoice number and order details ready as these details will be required when we get back to you. We’ll also let you know what documents will be required and also assist you with our terms and policy. Meanwhile please ensure that the cartridges are preserved and are kept unused in their original packaging and in a re-saleable condition. We will look into the matter and see if it can be exchanged or merits a refund by placing a credit on your account. Q. The quality of print that I get from my printer seems to be deteriorating. Does it mean that the ink cartridges installed are not working? I have recently replaced the cartridges with the new ones and not able to understand the matter. Please suggest! A. No, before thinking of other possibilities or alternatives, please clean the print head as doing that often solves the print quality problem. If not, you can clean the print head manually (by wiping it with a clean lint-free cloth), and if this still does not help, you may contact the customer support and decide the next course of action. Q. Can I scan using the Brother DCP 585CW printer? A. Yes, the printer has printing, copying and scanning capabilities that lets you perform all the functions using a single machine. Q. What should I do if white or horizontal lines appear on text or graphics? A. If the print quality is not up to the mark clean the print head. Also, make sure that you are using good quality Brother DCP 585CW Ink Cartridges in your printer. Q. Hi! I got the error message that my ink cartridge is not detected. What could be the reason? What should be done to correct this? Please help! A. This happens when you install a new Brother DCP 585CW Ink Cartridges too quickly that the machine could not detect it. To resolve this issue take out the new ink cartridge and reinstall it slowly. Another reason could be the usage of incompatible or low-quality ink cartridges, so the machine is not able to detect the cartridges installed in it. To solve this, use the correct cartridges only that are tested to the highest quality standards. Q. What is the print speed offered by this printer? A. 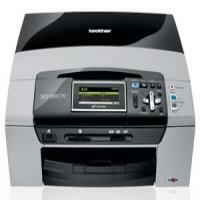 The print speed of the Brother DCP 585CW for printing in black is 33ppm and 27ppm for coloured one. Q. Will there be any ink cartridge failures? A. We aim at providing good quality products for our customers, but you might receive the failures in the Brother DCP 585CW Ink Cartridges occasionally whether you go for new or compatible ones. That's why we offer a guarantee for our cartridges. Q. Does this Brother DCP 585CW printer support memory cards? A. Yes, this printer support printing from memory card and also allows printing from USB flash drive. Q. What are the salient features of the printer? Q. What softwares are included in the Brother DCP 585CW printer? A. The Brother DCP 585CW support ScanSoft PaperPort SE 11.0, Brother ControlCentre2, Brother ControlCentre3, Brother MFL-Pro Suite, Presto! PageManager 7. Q. Is it legal to use remanufactured Brother DCP 585CW Ink Cartridges for my printer? A. No, it is not at all illegal to use refill or remanufactured or on the usage of compatible cartridges. The OEM Printer guarantee is clear on allowing the use of such cartridges. Q. Will these Brother DCP 585CW Ink Cartridges leak or dry up if not used frequently for a long time? A. Any cartridge whether the original or compatible one would dry up if it is stored for a long time when not in use. It is advisable to at least use the printer once every month to ensure the flawless working of it. Q. Does this printer has any resale value? A. Leading the market the Brother printers have a great resale value if it is sold in a working condition. Q. I have an old Brother DCP 585CW printer. It is no longer working well. I have spare Brother DCP 585CW ink cartridges and would like to know whether Brother DCP 145C printer is compatible with the cartridges I have already bought? A. Yes, you can use these cartridges with your Brother DCP 145C printer and this would work fine as its own compatible cartridges will do. Q. What if the Wi-Fi fails or not work properly? Is it still possible to print with a cable? A. Yes, the Brother DCP 145C printer support both WiFi and wired connection so you can still print by establishing a wired connection.